Effectively targets hard-to-reach eyebrow furrows, crow's feet and smile lines with microcurrent to improve eye and lip areas. The NuFACE Trinityå¨ ELE is a targeted microcurrent treatment attachment for your NuFACE Trinityå¨ device, FDA-cleared for facial stimulation. Microcurrent treatment wands gently stimulate hard-to-reach eyebrow furrows, crow‰Ûªs feet and smile lines to improve the appearance of the eye and lip areas. NuFACE Trinityå¨ device is required to use with this attachment. Exercise sculpts and tones the body, microcurrent contours and tones the face. Like exercise, benefits are visible and long-lasting with continued use. 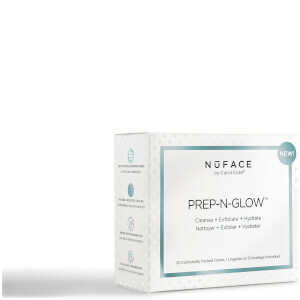 NuFACE is Fitness for Your Face, the easiest workout you‰Ûªll ever do! As we age, our body‰Ûªs natural current begins to slow down (like our metabolism) leading to sagging skin, loss of contour & wrinkles. Microcurrent mimics this natural current and goes beyond skin deep to tone facial muscles while improving contour, skin tone & reduction of fine lines & wrinkles. 1. Prep: Cleanse Skin and apply Gel Primer. 2. Lift: Glide or hold the NuFACE Trinityå¨ ELE on face as directed. 3. Finish: Remove Gel Primer with a damp cloth. like it a lot! Recommend this attachment. I had the sagging under eye area that seemed more like sliding this made so much improvement the first time. I saw my husbands reaction trying to figure out why my face had 'moved' It is defiantly a must have attachment for the Trinity device. Does Work, but Labor Intensive. Time-consuming but if you take the time, it seems to have the lifting effect. I was so happy with the result my Nuface gave me that I wanted the ELE attachment for my eye area. Well, I'm happy to report that it works, though I have not noticed a difference under my eyes. My brows are more lifted and my check bones are more defined. Thanks Nuface for such a great invention. It works well. I can feel less winkles after I use it. Easy control. Very convenient to use. Great add on to my NuFace. Now I can make better use of a device that I already use every day. Excited to start using in my neglected eye and lip area! Was not as easy to use as the Trinity since it is smaller. Only started using the ELE for 2 weeks and the eye lid seems to be more lifted. This is good attachment to the Tinity as I have a small face so I'm glad I'm able to work on the hard to reach areas. Looking forward to better results than just using the Trinity on its own. I love this one and it is good to work on my eyes and lips.